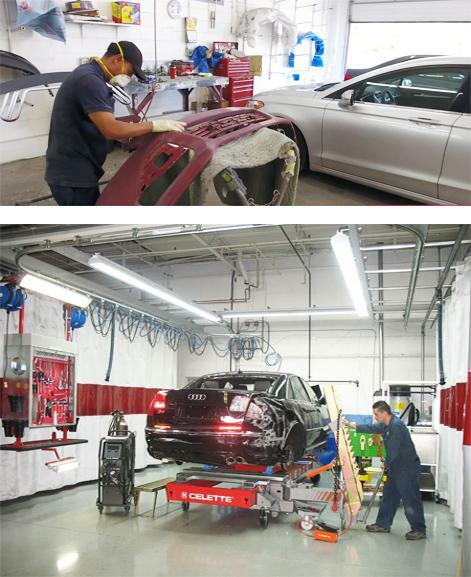 Experience and Knowledge – We employ ASE certified technicians for all areas of work performed and our staff posses several years of experience in the auto body repair industry. We take pride in being able to pin-point problems quickly so we can get you back on the road faster. We are a results driven company, meaning that we know the power of referrals so we strive to provide an unexpected level of satisfaction, so that you will feel comfortable referring your family and friends to us. We know the frustration you have when your car or truck is not running and we strive to complete your repair or maintenance service as quickly as possible. Our service rates are very competitive and we work on both foreign and domestic vehicles. We have the experience and know how to get the job done right the first time. Our location is very convenient and easy to find. Be sure to contact us today and find out why so many people have chosen us for all their automotive service needs. We provide the following professional auto body services performed by highly trained technicians. Your vehicle is ready for repairs, and all damaged parts are removed, and the vehicle is “de-trimmed”. If hidden damage is revealed, we prepare a complete supplemental report of the additional damages, we locate required parts and pricing, secure authorization or a re-inspection by your insurance company, and then contact you with not just the problem, but the solution as well. You’ll have lots of questions, and we make sure to have the answers. We will never proceed without your complete understanding, and approval of required work. Our Shark diagnostic measuring system measures your frame or unibody vehicle by sonar. We can determine frame/unibody damage within millimeters, and of course put it within factory specifications provided by the vehicle manufacturer. Sheet metal repairs are handled in dedicated bays equipped with the latest equipment, including welders and materials like those used by automobile manufacturers. Paint and clearcoat, the same coatings applied at the factory on most of today’s vehicles, are used exclusively in our state-of-the-art spray-bake booths. One of the largest investments our facility has made has been in our Zhangda booths, and what a return! Our flawless refinishing of your vehicle will be proof-positive that it was money well spent! After repairing then refinishing your “de-trimmed” vehicle, the next step is to place the job back with your body technician for re-assembly. This is a precise stage as headlamps, door handles, bumpers, interior trim, and grilles are put back on the vehicle. All components are tested and in working condition before the technician continues. If required, once all of the weight is put back on the vehicle, it is now ready for suspension alignment. This is also the department that recharges your air conditioner, tops off fluids, test drives, and mechanically inspects your vehicle for safety. Now the vehicle is ready to be cleaned for delivery. Inside and out, engine compartments, trunks, under-carriage. We want to remove any signs that we were there! We want to return your vehicle in better condition than before it was wrecked, and make it look like it was never damaged. All aspects of the repair are inspected to factory tolerances by your Service Manager. They perform a 22 point inspection, including horns, taillamps, air conditioning, heating, engine gauges, cleanliness, power locks, trunks, windows, and fuel doors. The vehicle is test driven, radio working, and final estimate checked against vehicle to make sure that if we have charged for something, that operation was done, or it is removed from your bill. Your Service Manager will confirm waived deductibles, location of insurance draft, and secures any supplemental damage payments before you arrive so there are no unexpected delays when you pick up your vehicle. This inspection is the most important. It is performed by you, our customer. You must be completely satisfied with the quality of your repairs, the treatment you received as one of our clients, the color match of your perfect paint. There will be no uneven gaps, and your vehicle is cleaner than before it was damaged. This is our goal each and every time. We appreciate you giving us the opportunity to meet, and exceed your expectations. At One Stop Auto Body we do not compromise quality. As a family owned and operated organization, we do business the old fashion way, Under promise and over deliver is a day to day goal for us. If you are looking for a Auto Body Shop that cares about you and the Quality of your repair call One Stop Auto Body. We Work with all Insurance Companies but WE WORK FOR YOU !!! Tell us what your car needs. Receive a free, fast & fixed quote. One Stop is absolutely wonderful! I can’t believe it was this easy to fix my car to you guys. We would certainly love to use One Stop theme again! They give a good honest price. My wife and I have both used Auto Fix It for both of our cars and have always had excellent results.